Governor Philip Murphy, of New Jersey, USA, a ‘lifelong practicing Catholic’, has signed the “Medical Aid in Dying for the Terminally Ill Act”, on April 12, 2019, and made this incredibly thoughtful and compassionate statement (below) in support of assisted dying choice, at the time of signing. Posted by Ian Wood. 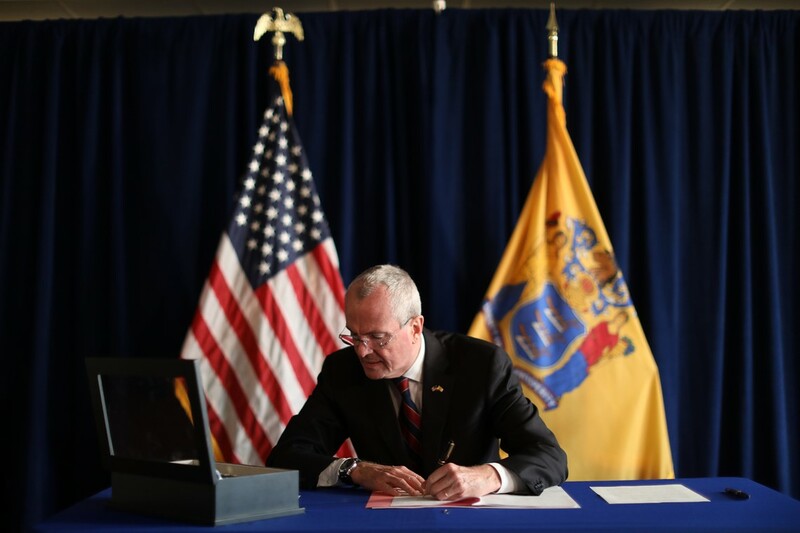 New Jersey Gov Philip Murphy ……..
Today I am signing the “Medical Aid in Dying for the Terminally Ill Act”, Assembly Bill No. 1504 (Second Reprint), which permits terminally ill, adult patients residing in New Jersey to obtain and self-administer medication to end their lives peacefully and humanely. I commend the bill’s sponsors — particularly Assemblyman Burzichelli, for whom this bill has been an extremely passionate and personal mission since he first introduced it seven years ago — for their tireless efforts to craft legislation that respects the dignity and autonomy of capable individuals to make end-of-life decisions. The legislation I am signing today is the product of a near-decade long debate among policy makers, religious organizations, experts in the medical community, advocates for persons with disabilities, and patients, among many others. Without question, reasonable and well-meaning individuals can, and very often do, hold different moral views on this topic. Through years of legislative hearings, countless witnesses, many of whom shared deeply personal and heart-wrenching testimony, offered compelling arguments both in favor of and against this legislation. As a lifelong, practicing Catholic, I acknowledge that I have personally grappled with my position on this issue. My faith has informed and enhanced many of my most deeply held progressive values. Indeed, it has influenced my perspectives on issues involving social justice, social welfare, and even those topics traditionally regarded as strictly economic, such as the minimum wage. On this issue, I am torn between certain principles of my faith and my compassion for those who suffer unnecessary, and often intolerable, pain at the end of their lives. 18/02/2019 / Ian Wood / Comments Off on Christians Supporting Choice for VAD in Australia interview with Canadian Atheist. I was delighted to have the opportunity to be interviewed by journalist Scott Jacobsen of the Canadian Atheist. Scott posed a series of questions on my approach with Christians Supporting Choice for Voluntary Assisted Dying. I hope readers find the article of interest. “I see assisted dying as one more tool in the service of palliative care’s core mission of alleviating suffering” – Dr Sandy Buchman, Canada. As a palliative care specialist, Dr Buchman acknowledged that his personal journey towards accepting assisted dying had spanned over two years. He stressed that it was his belief high quality palliative care was key to good end of life planning, but that assisted dying did not threaten the provision of such care, but somewhat perversely strengthened the case for ensuring that palliative care was accessible and available. Closing on a personal example, Dr Buchman explained that whilst he was initially hesitant about the prospect of assisted dying, he ultimately decided that helping patients who wanted to decide when and how they died, was an extension of what he had been doing already: helping to relieve suffering. Dr Buchman explained that when he first participated in an assisted death, for a professor of medicine suffering from Lewy body dementia, he had been struck by the sense of “illumination”, as though “a weight had been lifted”, when he agreed to discuss the prospect of an assisted death, let alone participate. He explained that whereas before his patient had explained he felt hopeless, especially after exhausting the options of traditional palliative care, the option of an assisted death enabled the patient’s mood to lift, and allowed him the dignity to die from a peaceful death surrounded by those he loved. Ian Wood comments: I frequently read how the option of assisted dying, once the patient has been accepted, is palliative in its own right and a tremendous morale booster for that dying person. Rev Craig Kilgour, New Zealand. Sermon – My nephew had an assisted death in Canada: it was compassionate, it was humane, it was right and good. 30/12/2018 / Ian Wood / Comments Off on Rev Craig Kilgour, New Zealand. Sermon – My nephew had an assisted death in Canada: it was compassionate, it was humane, it was right and good. From our friends across the Tasman I have this Sermon in strong support of Assisted Dying from Rev Craig Kilgour, when Interim Moderator at St Columba’s Presbyterian Church, Havelock North, New Zealand.. It is quite unique in that a nephew of Craig had an assisted death in Canada. The last two paragraphs of the sermon sum up the compassionate Christian approach to Assisted Dying Choice: Let me finish this with what my family members said and repeated often using these words about my nephew’s death: It was compassionate, it was humane, it was right and good. And the family are very proud and humbled with the courage he showed in his battle with cancer. And to me no one has the right to be critical and judgemental of the choice he made. So for me and my family this is not a philosophical debate, it is not a theological debate, it is not a theoretical debate, it is a reality and it was right and my nephew was fortunate he lived in Canada. The sermon is posted here with the kind permission of Rev Craig. In response to my question on what was the reaction of his congregation to the sermon Craig replied: the reaction from the congregation was very positive with many copies requested. Copies went wider into the community. I’ve been asked to speak to a retired group of Doctors at Hastings hospital. The topic I’ve chosen for the sermon might seem strange for a morning when we celebrate the birth and baptism of Angus, but then I thought when life ends, we celebrate the life lived whatever the length. I mentioned my dilemma to Granddad David and he said it evens things out! I want to share with you this morning about what our family has experienced just recently. I’m going to talk to you about assisted dying, euthanasia, a topic which is difficult to deal with, and it provokes very strong feelings. The End of life choice Bill is currently with Parliament’s Justice Select Committee. There have been 35 000 submissions – think about terminal illness, a few months to live, sound mind, to allow physician-assisted death. I with some of the congregation, attended a discussion on the Bill, that our MP Lawrence Yule had called with a panel of experts at our Community Centre a while ago. The issue has been debated by the General Assembly of our church and they were unanimously opposed against supporting the Bill before Parliament. After I took the service on 30 September, I went across to Takaka for the memorial service for my nephew who had died in Canada. He was 47 years old. The memorial service was held on Wednesday 3 October in the Pohara Boat Club – a place where he loved racing his yachting. I did the eulogy and the internment of ashes at the local cemetery. It was hard taking part in the service but good to spend a week with the family. I got back home last Monday. So let me give you a background that led up to his death in Canada on 18 September. The measure [to include this in a referendum] would offer the dying an option to minimize needless suffering. Here are some quotes from Rev Ellison. I do urge viewers of this post to read the full article at the link below. 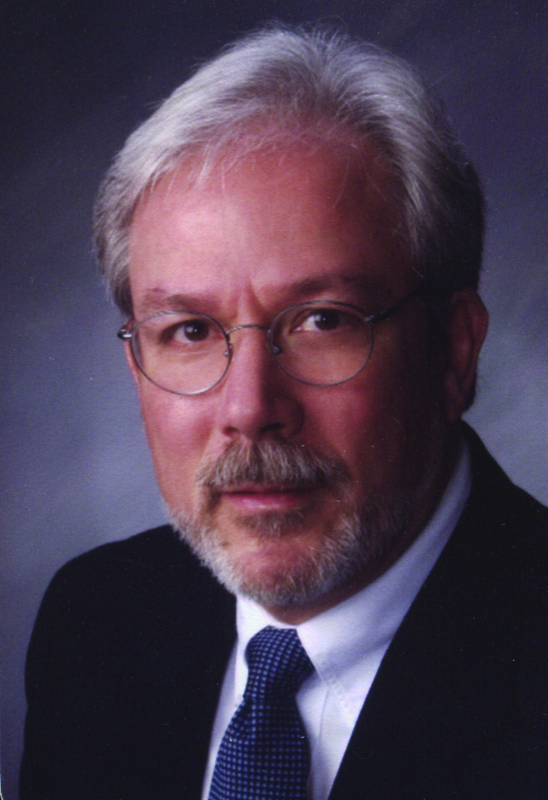 Rev Dr Marvin Ellison, a Willard S. Bass Professor Emeritus of Christian Ethics at Bangor Theological Seminary, USA, is a scholar-activist and ordained Presbyterian minister. An outstanding group of experts gave us the facts in this Forum on voluntary assisted dying support. Essential viewing! The emotional plea by Jan, wife of Tim Edwards, and their daughter, Jessica, who spoke at the meeting about the torturous death of Tim from mesothelioma certainly bought tears to my eyes! I just cannot understand why our MPs continue to ignore such futile suffering, especially those who profess to be Christian. Where is their compassion? I had the privilege of meeting Tim not long before he died, and together we went to lobby our local MP, Jai Rowell. 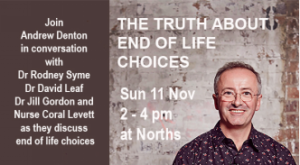 Every MP who is against this choice, and all members of the ‘ACL” (Australian Christian Lobby) and the ‘HOPE no euthanasia’ group should watch the complete forum and become familiar with the truth behind the issue, and then perhaps understand why up to 85% of Australians support voluntary assisted dying. I, Ian Wood, wrote to NSW Senator Burston a cover letter to accompany a letter from Carol Cronk, that outlined an incurable neurological condition that Carol is experiencing, and asking the Senator to support the Restoring Territory Rights (Assisted Suicide Legislation) Bill, that could have resulted in a voluntary assisted dying law. Carol is a committed supporter of our group. We were both very pleased when we received this letter of support from the Senator. Burston clearly states “I will be supporting the bill”. Yet eight days later he voted against the bill! He did not speak on the Bill during the debate. Readers will note that the Senator has One Nation Senator on his letterhead, and signs himself Senator for United Australia Party. In retrospect that should have alerted my to the fact he could be two-faced! Combined with Senator Georgiou, who also changed from a vote Yes, to a vote No, the Bill was lost 36 votes to 34. I will leave readers to decide on the morality and ethics of this situation. Just what pressure was applied at the very last minute to Burston, and by whom? 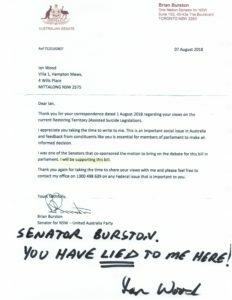 After the vote, I sent Senator Burston’s letter back to him, with my comment written on it. Clearly I was not happy! Carol was quite devastated. Obviously Burston has no thought or compassion for the damage his change of position has done for the truly vulnerable – those like Carol. Carol also wrote back to Senator Burston, and with her permission I include the letter here. I will update this post if we receive a reply from the Senator. Our hearts/spirits were intensely lifted by your positive letter to us, dated 7 August 2018 (Ref TS20180807) advising us that you absolutely were going to vote for the Restoring Territory Rights legislation, and this gave us hope that it would ultimately lead to “euthanasia- end of life choices”. I write to now to express my disgust and betrayal of this letter of support. You have turned your back on us all, by voting against the bill. I/we were so crushed by it, especially as your vote destroyed all of our hopes. Prime Minister Turnbull, your opposition to the NT right to legislate for Voluntary Assisted Dying is totally undemocratic! 10/08/2018 / Ian Wood / Comments Off on Prime Minister Turnbull, your opposition to the NT right to legislate for Voluntary Assisted Dying is totally undemocratic! On Tuesday 14 August 2018 the Senate is set to debate legislation lifting the ban on NT and ACT controlling their own voluntary euthanasia laws. “If the vote came on, if I was a Senator, I would be voting against it,” Mr Turnbull said on SBS News. This is in spite of the fact that Victoria passed their Voluntary Assisted Dying law last year. So Mr Turnbull, you believe the 250,000 people of the NT should be denied “the inalienable rights and freedoms” permitted the people of Victoria! Mr Turnbull. Your position is both hypocritical and totally undemocratic. Assisted dying is an “ill-considered and dehumanising” practice reflecting a society in which there is more loneliness, Canberra’s Catholic archbishop Christopher Prowse has told an inquiry. He spoke at an ACT Legislative Assembly committee’s second day of hearings into assisted dying in which doctors rubbished claims that palliative care could always manage end of life pain. Archbishop Prowse told the committee it was a “lonely policy that only an atomised society would think about”, and said people approaching death experienced a “rollercoaster” that saw them take back comments they wanted to die earlier. He said it would be a “fundamental mistake” to put vulnerable people at “grave risk” by allowing assisted dying. When asked what was a good death, Archbishop Prowse recounted a time he sat with a woman as she died, and she squeezed his hand. “I could tell she was on a journey but how grateful she was when she was with us,” he said. He admitted people he had spent time with as they were dying had said they wanted to die right away. However they changed their mind later, he said. I refer to the report of your evidence given to the ACT Assisted Dying hearing as reported in The Age, 18.5.2018. You ignore the fact that over 1/3 of terminal patients in Oregon USA, who are given access to voluntary assisted dying medication, at their considered, repeated rational request, do not go on to take that fatal medication, but it does provide peace of mind in that they can choose to exit life if the suffering becomes unbearable. Having access is palliative in its own right. Certainly when my sister-in-law Joyce died from ovarian cancer that had spread to her bones, she was not capable of squeezing any hands during her last two days! She said goodbye to her husband and family on a Sunday afternoon, but lingered on in a semi coma for another two days. In moments of lucidity she would ask why am I still here? Her husband is still suffering from the trauma of watching these last days. How much better and more compassionate it would have been for Joyce if she could have asked for, and been given medication to assist her to go to sleep and not wake up, after those final goodbyes.